On Windows, compatible with Windows 2000 or later. IMPORTANT: network play is currently only available with the Macintosh version. Any Macintosh (Intel or PowerPC) compatible with MacOS X 10.3.9 or later. 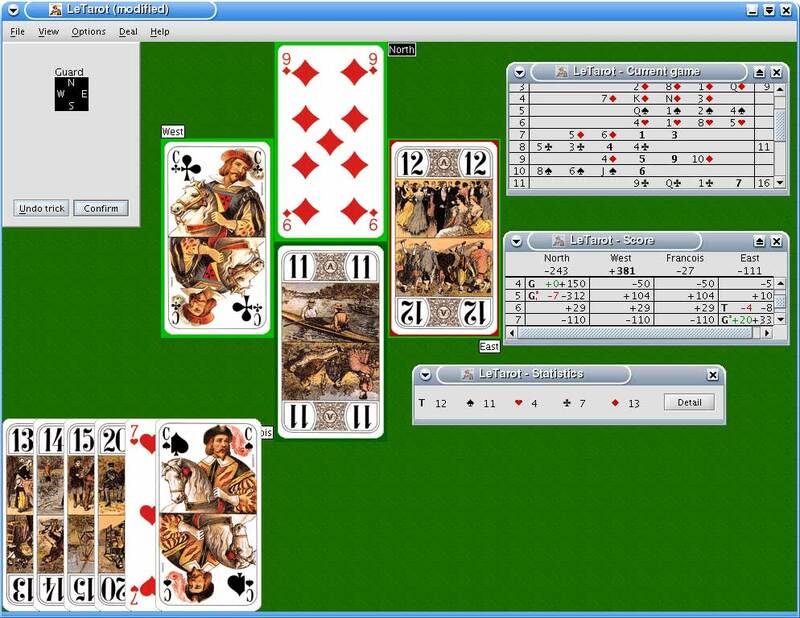  "LeTarot" is THE software which allows you to play the Tarot card game according to the 4 players rules of the French Federation of Tarot. 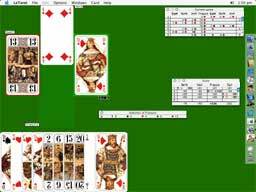  At any time, you can play Tarot with partners in bone and flesh or else in silicon! 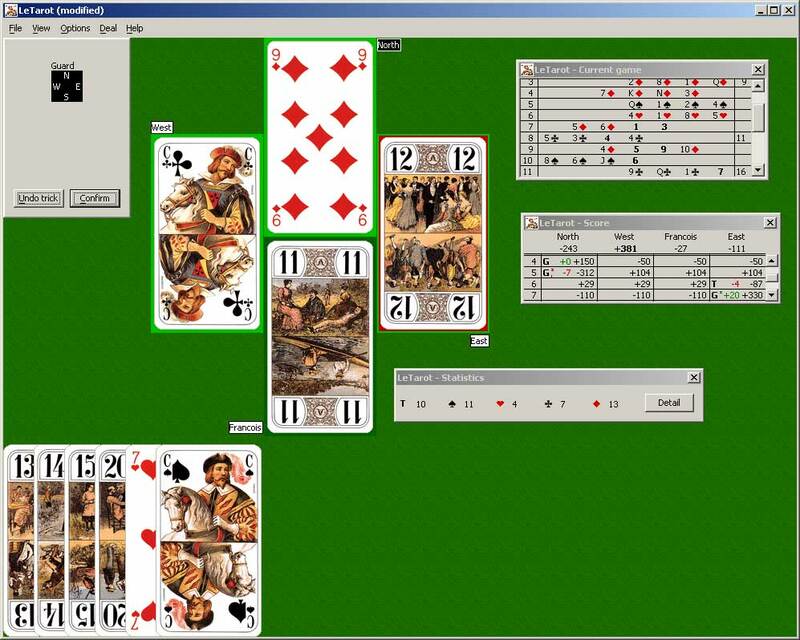 If you find only one partner or even none, the computer will replace the missing players with a very powerful playing engine. (Currently only available with the Mac Edition).  The cards are not there physically but they are always on the screen more beautiful than ever! They are authentic digitalized cards from a card deck of the EDITIONS DUSSERRE, a reprint of one of the first New Tarot of 1890.  You lost the count of the trumps? Was the lady of Heart already played? No problem: the player has the possibility to display statistics of the game in progress! Played cards, who has what or probably what... and also all the tricks of the game in progress! 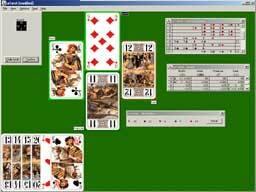 Moreover the player can receive the help of the computer for all the phases of the game (bid, discard, card play): this can be very instructive for the rookie players. All those possibilities not always legal can of course be locked by the organizer of a tournament.  The deals of a tournament can be prepared in advance with the included deal editor. This option also allows the creation of Tarot problems.  A game, a tournament can of course be saved and be continued later on.  An additional interest compared to the tournament between friends: the duplicate tournament . During those tournaments, each participant plays the same deal as the taker and the computer plays the 3 defenders. The winner is the player who will have the best score after several games. No more of these cursed evenings without any play, never being able to take. With the duplicate, all the participants are each time the Taker!